An authoritative account of Western civilizations. 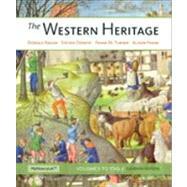 The Western Heritageprovides the broadest possible introduction to Western civilization in a strong, clear narrative. It fosters lively debate about the West, defines how the West has interacted with other cultures, and shows how Western civilization can be used to understand global challenges today. The text integrates social, cultural, and political history, and it provides a flexible presentation to accommodate different teaching and learning approaches. The 11thedition is tied closely to MyHistoryLab, with icons connecting the main narrative to an array of MyHistoryLab resources, including documents, video segments, and interactive maps. The authors welcome Alison Frank, professor of history at Harvard University, to their team for this edition. A better teaching and learning experience This program will provide a better teaching and learning experiencefor you and your students. Here's how: Personalize Learning -The new MyHistoryLab delivers proven results in helping students succeed, provides engaging experiences that personalize learning, and comes from a trusted partner with educational expertise and a deep commitment to helping students and instructors achieve their goals. Improve Critical Thinking -Chapter opening and end-of-chapter study resources help students understand the themes and spark class discussion. Engage Students- Box features included throughout the text encourage the use of visual and textual sources while promoting debate about the West. Support Instructors- Instructor's eText, MyHistoryLab, Instructor's Resource Manual, Test Item File, MyTest, PowerPoint presentations, and Class Preparation are available. For the combined volume of this text, search ISBN-10: 0205393926 For volume 2 of this text, search ISBN-10: 0205434517 Note:MyHistoryLab does not come automatically packaged with this text. To purchase MyHistoryLab, please visit:www.myhistorylab.comor you can purchase a ValuePack of the text + MyHistorylab (at no additional cost): ValuePack ISBN-10: 0205896227 / ValuePack ISBN-13: 9780205896226. DONALD KAGAN is Sterling Professor of History and Classics at Yale University, where he has taught since 1969. He received the A.B. degree in history from Brooklyn College, the M.A. in classics from Brown University, and the Ph.D. in history from Ohio State University. During 1958 to 1959 he studied at the American School of Classical Studies as a Fulbright Scholar. He has received three awards for undergraduate teaching at Cornell and Yale. He is the author of a history of Greek political thought, The Great Dialogue (1965); a four-volume history of the Peloponnesian war, The Origins of the Peloponnesian War (1969); The Archidamian War (1974); The Peace of Nicias and the Sicilian Expedition (1981); The Fall of the Athenian Empire (1987); and a biography of Pericles, Pericles of Athens and the Birth of Democracy (1991); On the Origins of War (1995) and The Peloponnesian War (2003). He is coauthor, with Frederick W. Kagan, of While America Sleeps (2000). With Brian Tierney and L. Pearce Williams, he is the editor of Great Issues in Western Civilization, a collection of readings. He was awarded the Na-tional Humanities Medal for 2002 and was chosen by the National Endowment for the Humani-ties to deliver the Jefferson Lecture in 2004. STEVEN OZMENT is McLean Professor of Ancient and Modern History at Harvard Univer-sity. He has taught Western Civilization at Yale, Stanford, and Harvard. He is the author of eleven books. The Age of Reform, 1250—1550 (1980) won the Schaff Prize and was nominated for the 1981 National Book Award. Five of his books have been selections of the History Book Club: Magdalena and Balthasar: An Intimate Portrait of Life in Sixteenth Century Europe (1986), Three Behaim Boys: Growing Up in Early Modern Germany (1990), Protestants: The Birth of a Revolution (1992), The Burgermeister’s Daughter: Scandal in a Sixteenth Century German Town (1996), and Flesh and Spirit: Private Life in Early Modern Germany (1999). His most recent publications are Ancestors: The Loving Family of Old Europe (2001), A Mighty For-tress: A New History of the German People (2004), and “Why We Study Western Civ,” The Pub-lic Interest, 158 (2005). FRANK M. TURNER is John Hay Whitney Professor of History at Yale University and Direc-tor of the Beinecke Rare Book and Manuscript Library at Yale University, where he served as University Provost from 1988 to 1992. He received his B.A. degree at the College of William and Mary and his Ph.D. from Yale. He has received the Yale College Award for Distinguished Undergraduate Teaching. He has directed a National Endowment for the Humanities Summer Institute. His scholarly research has received the support of fellowships from the National En-dowment for the Humanities and the Guggenheim Foundation and the Woodrow Wilson Center. He is the author of Between Science and Religion: The Reaction to Scientific Naturalism in Late Victorian England (1974), The Greek Heritage in Victorian Britain (1981), which received the British Council Prize of the Conference on British Studies and the Yale Press Governors Award, Contesting Cultural Authority: Essays in Victorian Intellectual Life (1993), and John Henry Newman: The Challenge to Evangelical Religion (2002). He has also contributed numerous arti-cles to journals and has served on the editorial advisory boards of The Journal of Modern His-tory, Isis, and Victorian Studies. He edited The Idea of a University by John Henry Newman (1996), Reflections on the Revolution in France by Edmund Burke (2003), and Apologia Pro Vita Sua and Six Sermons by John Henry Newman (2008). Between 1996 and 2006 he served as a Trustee of Connecticut College and between 2004 and 2008 as a member of the Connecticut Humanities Council. In 2003, Professor Turner was appointed Director of the Beinecke Rare Book and Manuscript Library at Yale University. ALISON FRANK is professor of history at Harvard University. She is interested in transnational approaches to the history of Central and Eastern Europe, particularly the Habsburg Empire and its successor states in the nineteenth and twentieth centuries. Her first book, Oil Empire: Visions of Prosperity in Austrian Galicia (2005), was awarded the Barbara Jelavich Book Prize, the Austrian Cultural Forum Book Prize, and was co-winner of the Polish Studies Association's Orbis Prize in Polish Studies. Her current book project, Invisible Empire: A New Global History of Austria, focuses on the Adriatic port city of Trieste and the Habsburg Monarchy's participation in global commerce in the long nineteenth century. Other interests include the Eastern Alps, the Mediterranean slave trade, and environmental history. She is associate director of the Center for History and Economics. What Is the Western Heritage? PART 1: The Foundations of Western Civilization in the Ancient World to 400 C.E. PART 2: The Middle Ages, 476 C.E.—1300 C.E. Did Caesar Want to Be King? Who Runs the World: Priests or Princes? Is the “Renaissance Man” a Myth? A Raw Deal for the Common Man, or Just Desserts?